Mango | Infonet Biovision Home. 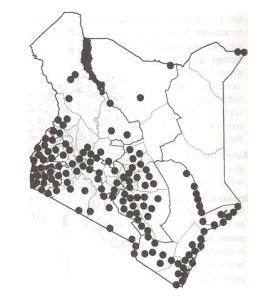 English (Mango); Kamba (Maembe); Kikuyu (Mwiembe); Kisii (Rieembe); Luhya (Liermbe); Luo (Maembe); Somali (Amba); Swahili (Mwembe); Tharaka (Mwembe). Individual mango trees often flower irregularly; some trees do not flower for periods of 10 - 20 years, sometimes even longer. Flowering starts at the beginning of the rainy season and fruits ripen at the end of the rainy season. Bisexual and male flowers appear on the same clusters. Soil type: Mango trees thrive in well-drained soils with pH ranging from 5.5 to 7.5 and are fairly tolerant of alkalinity. For good growth, they need a deep soil to accommodate the extensive root system. It may be propagated from seedlings or grafting. Irrigation in the 1st years after planting promotes flushing and suppresses flowering so that tree size increases quickly. Irrigation also widens the scope for intercropping, for example, with papaya, banana, pineapple or vegetables, during the establishment phase. When the trees are big enough to produce a substantial crop, irrigation is then stopped. Food: Mango is cultivated for the fruit, which can be eaten in 3 distinct ways: unripe, ripe (the common way to enjoy mango throughout the world), and processed (at various stages of maturity, in the form of pickles or chutneys, dried slices, canned slices in syrup, juice and puree or paste). Fodder: Mango leaves are occasionally fed to cattle, but it should not be in large quantities as it can cause death. Apiculture: M. indica is an important honey plant, secreting large quantities of nectar. Fuel: its wood makes excellent charcoal and firewood. Timber: Its wood is used for many purposes, including indoor construction, meat-chopping blocks, furniture, carpentry, flooring, boxes, crates and boat building (canoes and dugouts). Tannin or dyestuff: its bark is the source of a yellowish-brown dye used for silk. Poison: it has been noted that in sensitive individuals, ingestion of the fruit or skin contact with the juice may cause a rash like that of poison ivy. Medicine: It is said that charred and pulverized leaves make a plaster to remove warts and also act as a styptic. Seeds can be used to treat stubborn colds and coughs, obstinate diarrhoea and bleeding piles. Soil improver: leaves improve soil fertility when used as mulch for crops. 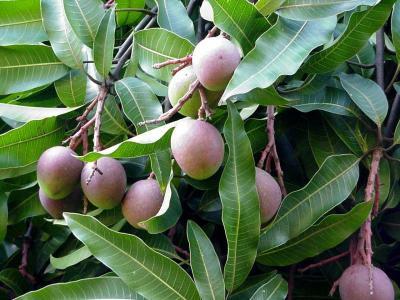 Intercropping: the mango tree is often interplanted with other fruits and vegetables, and the tree is a valued component of the traditional homegarden agroforestry system. Anthracnose attacks and distorts and turns developing leaves black and disfigures developing fruit. The fungal infection may spread to fresh young growth. It can be controlled with bimonthly applications of copper spray or captan as a growth flush begins and until the flowers open; spraying is resumed when the fruit begins to form. The flower panicles, young fruit and leaves are susceptible to powdery mildew (Oidium mangiferae), especially in rainy weather or frequent fog. A spray of powdered kelp at bud break will often control it. Sodium bicarbonate and fungicide sprays are also effective. Other diseases include the flower malformation caused by Fusarium moniliforme and spread by mites, and bacterial canker, which is becoming a pressing disease problem. 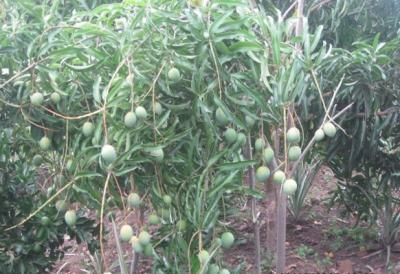 A mealy bug, Rastrococcus invadens, has recently invaded Africa, where it causes serious damage to mango and other crops. In the greenhouse, thrips often turn leaves rusty brown. Malathion is the conventional spray for insect pests; sulphur works on mites. A long-horn beetle (Rhytidodera simulans) bores into the trunk and thick branches; branches may be killed but the whole tree retains its viability. The larvae of the mango weevil (Cryptorrhynchus mangiferae) feed on the pulp and damage the fruit.